Plan now to join us. 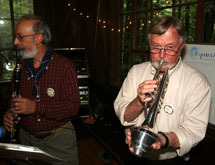 Scandia Camp Mendocino, a culturally unique annual weeklong residential camp founded in 1980, presents participants the opportunity to learn in depth about the folk music, dance and unique cultural traditions of Scandinavia. In the process, a community has developed of people exploring their cultural roots and of people with curiosity about and appreciation for the unique rich folk culture of Scandinavia. For a week, the Mendocino Woodlands becomes our common village, a second home. Scandinavia (primarily Norway and Sweden) in a welcoming community.